MOHNTON, Pa. – Champions were crowned in the NHRA sportsman classes on Sunday at the 34th annual Dodge NHRA Nationals held at Maple Grove Raceway. Anthony Bertozzi captured his 20th national event victory in Super Stock, Shane Oakes won his first NHRA national event in Stock Eliminator, Mike Robilotto collected his fourth national event victory in winning Super Comp, and Ray Sawyer picked up his sixth national event Wally with a victory in Super Gas. For those that have followed DragChamp recently, you know we started making pre-event winner predictions at the U.S. Nationals and continued this week at Reading. You can view the articles by clicking here for INDY and here for Reading. At INDY we accurately predicted Devin Isenhower’s Super Gas victory. This week DragChamp went off as we accurately predicted one of the finalist in each of the four sportsman categories and picked up three wins in those four finals. We accurately predicted Bertozzi, Robilotto, and Sawyer while we just missed with Anthony Fetch in Stock Eliminator after he posted a runner-up finish. With his win over New England Nationals champ Anthony Bongiovanni, Bertozzi collected his 20th NHRA national event Wally in his 34th final round. In the final round, Bertozzi posted a near-perfect .002 reaction time to Bongiovanni’s .048 and cruised to a .022 over 9.062 to take the breakout win over Bongiovanni’s -.011 under 8.919. In the semifinals, Bertozzi took out Brittany Boltz after she missed the tree and ran .091 over her dial. Bertozzi was deadly at the tree with a .014 light which allowed him to ease up to post an .081 over 9.111 to move into the final. In earlier rounds, Bertozzi defeated Duane Eiskant, Michael Iacono, Gary Richard, and Joe Lisa to reach the semifinals. Although Bertozzi will not be able to claim points from his Reading victory, the win has to give him confidence heading into the final two Lucas Oil Drag Racing Series events that will count towards his national championship score. Bongiovanni performed well in reaching his second national event final round. Bongiovanni took out Dan Fletcher, James Antonette, A. Lincoln Morehead, and William Kennedy before receiving the bye in the semifinals. Shane Oakes captured his first NHRA national event Wally after posting a dead-on the dial 11.144 in the final to turn back DragChamp pick Anthony Fetch. Oakes, who posted three .00 lights during eliminations, left with a .017 light in the final round to Fetch’s .018. At the stripe, Fetch dumped to go .055 above while Oakes drove it through to a 11.144 on his 11.14 dial. Oakes best package during the race was a .004-second package in the second round. While Oakes took the bye in the semifinals, Fetch battled Donald Moulton for a spot in the final round. Fetch left first, .029 to .051, but gave up the stripe to go .049 above while Moulton ran -.005 under in the breakout loss. Had Moulton defeated Fetch we would have had a heads-up, no-breakout G/SA race in the final. In earlier rounds, Oakes defeated Carl Massafra, Lenny Williams, Frank Aragona Jr., and Ken Meile before taking the bye to the finals. Fetch defeated Kenneth Richard, Tom O’Loughlin, Pete Oakes, and Joe Santagelo before meeting Moulton in the semifinals. Mike Robilotto’s season just keeps getting better as he captured his second national event win of the year at Reading to go with his 2018 Jeg’s All Star victory. With the win, Robilotto is now fourth in the national championship points with one Lucas Oil Series event left to claim. On Sunday, Robilotto used a .022 package in the semifinals to defeat Howie Smith’s -.003 breakout pass. Runner-up Garretson had the bye run in the other semifinal. In the final, Garretson left first, .013 to .020, and drove it out-the-back-door to post a -.007 under 8.893 after taking a train-length at the stripe after Robilotto slowed to a 9.027 for the win. To Garretson’s defense, he only runs 130 mph so Robilotto was closing at about a 45 mph difference which is almost impossible to accurately judge. Garretson’s runner-up finish catapulted him into the lead in the national points chase. With one national and one LODRS left to claim, Garretson is in the driver’s seat in the national points chase. Ray Sawyer, appearing in his 13th national event final and his second straight Dodge NHRA Nationals final round, collected win no. 6 after defeating a red-lighting Dale Koncen in the final round. Sawyer jumped to second place in the national points standings after his latest triumph. INDY winner Devin Isenhower extended his lead in the national points chase with his fourth round finish at Reading. To earn his spot in the final round, Sawyer had to get past Division 1 hitter Jason Kenny in the semifinals. Sawyer posted his best package of the race against Kenny as he was .010 at the tree and dead-on 9.900 to deny Kenny another final round appearance as Kenny posted a .019 light and a 9.914 E.T. While Sawyer typically likes to dial his car and use his big 174 mph charge at the finish, he played the dump game with Kenny in the semi’s as he dropped 10 mph to go dead-on. Koncen was close to the dial throughout eliminations as he posted two 9.90’s, a 9.91, and a 9.89 to reach the final round for the second time in his career. Although the week was overshadowed by the Hurricane off the East Coast, the weather held up and the race was completed as scheduled. There were some great performances by a number of talented racers which will go a long way to determining the world championship at the end of the year. 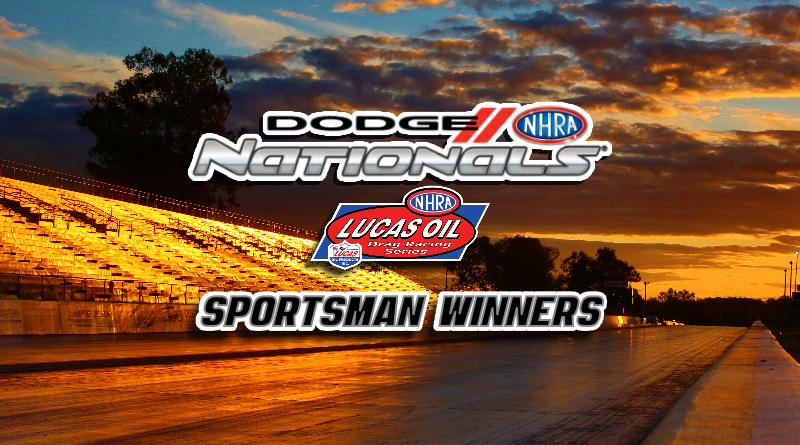 Congratulations to all of the Dodge NHRA Nationals event winners. For more event coverage of the Dodge NHRA Nationals click the following links: Event Preview, Friday Update, Saturday Update. DragChamp.com is the source for online NHRA sportsman class racing results. Check DragChamp daily for updates, news, results, and more from the world of sportsman drag racing.